Visual Studio Code (currently, Version 1.22 is available) is a very cool developer tool providing a modern and fast code editor with a bunch of extensions. 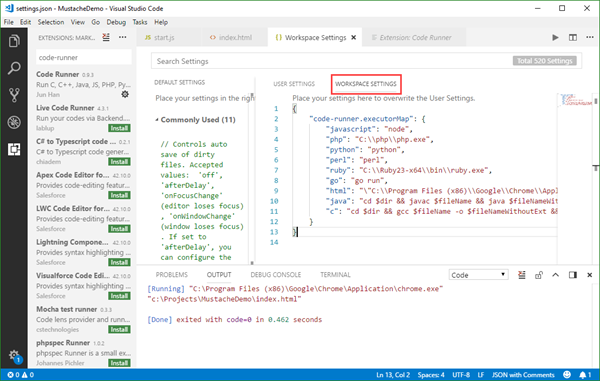 With extensions as Code-Runner, it's easy to run a code file or active text directly from the VS Code text editor. Check out this quick description how to configure and use Code Runner. If you are new to VS Code, at a glance: To install the latest version of VS Code, get the download for Windows, Linux or macOS. To run a command, launch the Command Palette with F1 or Ctrl + Shift + P, run Quick Open by pressing Ctrl + P, etc. See all keyboard shortcuts at Windows, macOS and Linux. As described in the Code-Runner marketplace description, the configuration must know, where to find the runtime executor. To set the executor path for the most common programming languages on your computer, check File / Preferences / Settings and open the Workspace Settings tab as shown here (see more at User and Workspace Settings). Paste the path to each programming language in here (see below) and press Ctrl + S to save the new settings. "c": "cd $dir && gcc $fileName -o $fileNameWithoutExt && $dir$fileNameWithoutExt"
Press Ctrl + Alt + N (or click the Play Button on the top right corner or press F1 and then select/type Run Code) to run a code file with the configured program. As shown below, press Ctrl + Alt + M to stop the code run mode. So, Visual Studio Code and extensions as Code-Runner are great tools for development on all OS platforms. If you are coming from Visual Studio and you are used to run ASP.NET apps with the integrated IIS, there are more extensions available as I wrote some time ago here. Happy developing with Visual Studio Code (and extensions)!